Patient-centered care is the latest catch phrase being used by health care administrators, politicians and policy wonks. It has become so frequent in its use it has actually supplanted the mandatory use of “evidence-based decision making” as this year’s mantra. Despite the mantra, most of us would be hard pressed to point to a specific initiative that trumps the patients’ interest over that of the interests of institutional health care providers. It is therefore interesting to see the response to the Canadian Medical Association Journal’s (CMAJ) recent editorial that calls upon hospitals to abandon 1 per cent of their revenue to make parking free. Having taken to heart the idea that decisions should be made on the basis of what’s best for the patients, Scotland and Wales abolished parking fees at their National Health Service hospitals. Dr. Rajendra Kale, the interim Editor-in-Chief at the CMAJ appropriately describes the present situation as “parking-centered care.” Dr. Kale says every doctor could tell anecdotes about patients preoccupied with parking fees, including fidgeting during a consultation and leaving early to avoid paying for another hour in the overpriced lot. We have previously noted that the system is an inherently unfair user fee that primarily falls on the elderly and the chronically ill. In June we wrote about Rouge Valley doubling its parking fees from $8 to $16 to patients who regularly attend its cardiac rehab program. Coupled with a $500 a year charge to stay in the rehab program beyond six months, the impact of the new parking rate meant cardiac rehab patients would face a cost of $1300 per year. Tom Closson, the departing OHA CEO, was quick to defend the use of parking fees, putting the 1 per cent revenue ahead of the interests of patients. He said OHA hospitals raise $230 million a year from parking. Who knows better the significant sum $230 million constitutes other than patients, families, and staff who are actually paying it? It wasn’t that long ago officials felt the hospitals could spare 1 per cent. The Central East LHIN ran an initiative where it encouraged hospitals to give up 1 per cent of their revenue to a community-based agency to deliver health care outside its walls. The initiative was a bit of a bust, and the LHIN later suspended it when core funding slipped well below the rate of inflation. It was hard to ask hospitals to give up 1 per cent when the government was giving them only 1.5 per cent. The most absurd response to the CMAJ comes from Health Minister Deb Matthews, who claimed parking fees do not come under the Canada Health Act, washing her hands of the issue by suggesting the public take it up with their local hospital. She ignores the Ministry’s own very prominent role in jacking up these fees. Each year the Ministry sets out a seven-step guide on how hospitals should address shortfalls in funding to balance their budgets. Number one on that list is to raise revenues, the first example being to raise parking fees. Given the expected squeeze coming next spring on hospital funding; it is likely more of them will look to parking revenues again. At a point when Toronto Mayor Rob Ford is proposing cutting TTC services, the University Health Network’s CFO Justine Jackson faced bad timing when she told the Toronto Star people do have a choice and can opt to take transit instead of paying the $28 a day UHN demands for parking. Others in smaller and more rural communities may beg to differ, as would those with mobility issues. 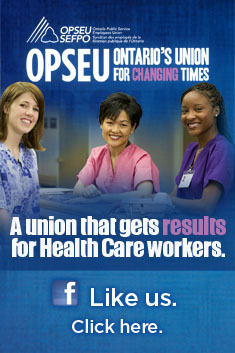 We frequently get out to hospitals across Ontario as part of our work here at OPSEU. The sight of sparsely filled parking lots is common. Local residents park in shopping centers and on residential streets to avoid paying for parking, often creating new problems for businesses, nearby homeowners, and municipalities. It is not unusual in small towns for the hospital to be the only location that charges for parking. At one location the hospital maintained a grace period, allowing drivers to park free for the first half hour. Given the parking lot was automated, we were told local residents who depart from the hospital regularly march to the entrance, take a new ticket, and drive away without charge. Some hospitals do offer discounts on parking to the most frequent users, whether they be in dialysis or rehab or family members visiting a patient who is in for a longer stay. Until recently, Rouge Valley had been one of them. It is interesting that hospitals note that even small parking fees can add up to substantial revenue for them, but so can a very small adjustment to the overall tax base, so that an unfair burden doesn’t fall on those who can least afford it. While it is unlikely hospitals will open their parking gates wide, the recent attention may at least draw some boards to rethink how much they are charging patients to visit their hospital, Canada Health Act or not. This entry was posted in Health System and tagged CMAJ, Drummond Commission, hospital parking, Rajendra Kale. Bookmark the permalink.